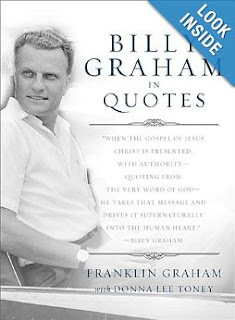 This book of quotes taken directly from writings (from 1947 to 2010) of Billy Graham's is one I plan to keep close by. The pages are like a river flowing from one place to the next of wise sayings and truth filled thoughts. The book is organized with 389 topics and each gathering of quotes starts off with a relevant Scripture. One would think a big book of just quotes would be blah or boring but the heart of a man all out for God shines through. I found myself reading straight through some times as well as grabbing the book to look up specific subjects in others. This book is right on as a resource for sharing Bible drenched thoughts in correspondence, for personal use, in writing and more. "We should go to no place that we would not go in His presence. Thomas Nelson sent me this book free of charge in exchange for an honest review.